Hormathia pacifica is a deepwater species recently described by us from East Pacific. It appears to be rather common at the Taney Seamounts where 66 specimens were documented photographically by remotely operated vehicles of Monterey Bay Aquarium Research Institute. This species was observed in situ at the Taney Seamounts living upon manganese encrusted basalt and, also, dead sponge tissue. SANAMYAN N.P., SANAMYAN K.E., LUNDSTEN L. 2015. Two new deepwater sea anemones (Cnidaria: Anthozoa: Actiniaria) Sicyonis heliodiscus sp.n. 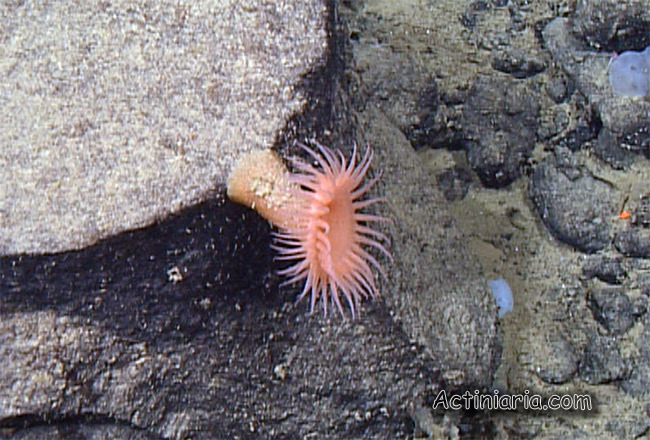 (Actinostolidae) and Hormathia pacifica sp.n. (Hormathiidae) from Pacific. - Invertebrate Zoology, 12(2): 131-149.